What is Lumiere London 2018? 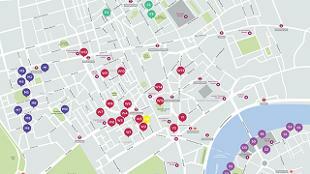 The free outdoor light festival is the biggest festival of light in London to date. 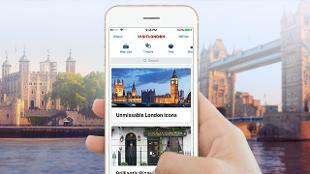 It returns to London for the second time following the success of the first edition in January 2016, when it attracted an estimated 1.3 million visits over four nights in London's West End, Mayfair and King’s Cross. Find out which installations are part of Lumiere London 2018, and check out our FAQs. Each Lumiere festival invites international and local artists to create works that light buildings and public spaces, transforming cities across the UK and changing the way we think and feel about public space. The first Lumiere light festival took place in Durham in 2009. Originally planned as a one-off, Artichoke has brought the event back to England’s north east every other year since, commissioned by Durham County Council. Lumiere has also travelled to other cities in the UK, including in 2013 when Lumiere Derry Londonderry was the finale to the first UK City of Culture celebrations. Explore the Lumiere archive to find out more about past Lumiere festivals. 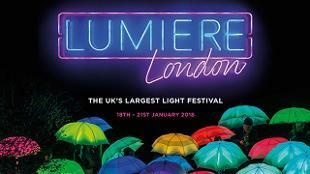 Lumiere is produced by Artichoke, the UK’s leading producer of outdoor art events. Founded in 2005 by Helen Marriage and Nicky Webb, the company’s aim is to work with artists to create unique, large-scale experiences that appeal to the widest possible audience. Artichoke’s projects take place outside of traditional arts venues, with previous projects including bringing central London to a standstill with The Sultan’s Elephant; broadcasting love poetry from illuminated tents along the coastline of the UK for Deborah Warner’s Peace Camp; and burning a 140m-long (460ft) model of 17th-century London on the Thames for London’s Burning, to mark the 350th anniversary of the Great Fire of London. Artichoke is a registered charity.